Release of the Yamaha i-CUBE Series model YSH20 - News Releases | Yamaha Motor Co., Ltd.
Yamaha Motor Co., Ltd. announces the development of the new i-CUBE series model "YSH20" as a flipchip*1 hybrid placer that achieves outstanding productivity and high-precision mounting. This model will be released in January 2011. The new YSH20 is a surface mounter specially designed to mount printed circuit boards, etc., with the flipchips that are used in increasing numbers today in IT communications devices and electric home appliances. It features a high-rigidity frame and dual mount heads and is fitted with a chip recognition system employing a camera with high resolution performance. In addition to providing high levels of mounting accuracy, YSH20 is designed to be compliant with a 12-inch wafer supply unit (optional). When flipchips are mounted from wafer supplying it is possible to achieve a mounting capability of 4,500UPH*2 (0.8sec/unit  in operation under Yamaha Motor designated conditions), which is approximately twice the speed of the existing Yamaha mounters. The new YSH20 is designed to meet the high-production needs of manufacturers. The release of this new product will strengthen Yamaha Motor's position in the semiconductor device manufacturing machine industry. *1 Flipchip: A type of semiconductor chip with an array of electrical connection bumps on the electrode terminals of the chip surface that is mounted by "flipping" the chip so that the bumps align with the corresponding electrodes on the printed circuit board. Compared to wire bonding using fine gold wire, mounting the chip directly to the circuit board in this way saves board surface space and shortens wiring. This improves the electrical characteristics and thus enables greater compactness and multifunctionality of devices with semiconductors. *2 UPH (Unit Per Hour): Total number of chips mountable in one hour. Indicates mounting potential under given conditions. 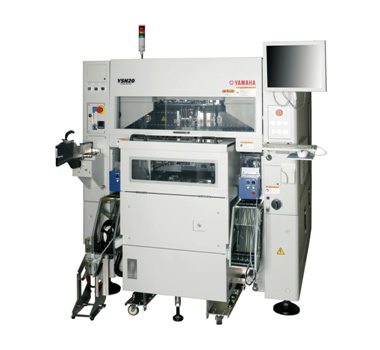 Since 2000, Yamaha Motor has used its surface mount technology to introduce its "i-CUBE" series of hybrid placers capable of performing a wide range of functions from surface mounting to automated assembly and manufacture of semiconductor products employing flipchips, etc. This series has been well received in the industry for its outstanding accuracy and versatility for a wide range of applications. Meanwhile, the trend toward greater compactness, density and multi-functional capabilities of the device modules used in cell phones, smart phones and digital home electronics has accelerated in recent years, and the market and scale of production for these products have grown. This has brought a need for surface-mounters with greater precision and production rate. At the same time there has been a growing call from manufacturers for machines with the capacity for mounting a mix of semiconductor devices (chips) and passive components and the capacity for multi-chip mounting involving the different types of devices (chips). The new YSH20 is designed to answer these industry needs by offering the proven versatility of the i-CUBE series models and adding higher levels of precision and speed. The YSH20 will strengthen Yamaha Motor's position in the semiconductor device manufacturing machine industry. By adopting dual mount heads, a multiple nozzle (2 nozzles/head) design and wafer supply, a flipchip mounting rate of 4,500UPH (under Yamaha Motor designated conditions) has been achieved. The combination of a high-rigidity frame and beam designed by thorough structural analysis and testing, a Yamaha-developed linear motor that enables high-speed action and outstanding positioning performance, and the newly developed high-precision mounting head and an upgraded version of Yamaha Motor's MACS (Multiple Accuracy Compensation System) have helped achieve a mounting accuracy of (3σ) ±10 microns needed for a mass-production type flipchip hybrid placer. A newly developed high-resolution chip recognition camera enables a higher level of mounting accuracy by recognizing the electrical connection "bumps" on the electrode terminals on the surface of the flipchip held by the head nozzle, checking for defective or absent bumps and compensating placement based on the position of the bumps. Compact high-precision load control heads have been developed to accommodate increasingly compact and thinner chips. The unit is designed to handle a variety of chip types ranging in size from 0.3mm to 18mm to ensure optimum mounting capability. Furthermore, two types of wafer ejectors are provided as standard equipment to make programming possible for different sizes and shapes of chips. The unit mounts a versatile transport system capable of handling ceramic circuit boards, flexible circuit boards, lead frames and carrier conveyance. Plans call for another model with additional nozzles for even higher production rates to be developed and released in the near future.